We are a friendly club which welcomes male and female cyclists of all abilities. We meet on Tuesdays and Thursdays during the summer months at 6.30pm in the old A30 lay-by. This is the one just beyond the road bridge to Weston and the Otter Inn. For evening rides, we form up to four groups based on speed and distance. Group 1 average 18 – 20mph, Group 2 averages 15 – 18mph, Group 3 averages 12- 15mph and Group 4 rides at the pace of the slowest rider, usually averaging no more than 12mph. distances depend upon the weather conditions and amount of daylight. Sunday morning rides tend to be more informal, starting at different points around Honiton and often stopping for coffee and cake somewhere! In addition, riders often organise weekly rides during the day, especially when it is too dark to ride in the evenings. We always wait frequently along the routes to make sure that no one gets left behind. Different people lead rides, so there is a variety of locations. We range from the ‘active retired’ to those who regularly take part in sportives, triathlons and the Iron Man. We have social events during the year, which have included BBQs, social rides with coffee stops, trips to France, and, for the first time in 2018, a joint Duathlon with Honiton Running club. Any suggestions are welcome. Members regularly post ideas, suggestions for impromptu rides and information on the Facebook page. Club members receive regular updates via email. We are affiliated to British Cycling and CTT. We are happy for guests to join us for up to three rides to see if we provide what they are looking for and then ask that guests become paid-up members. New members can join the club here. We are a bunch of enthusiasts who enjoy cycling and exploring the Devon countryside. Riders under 18 years of age must be accompanied by an adult. 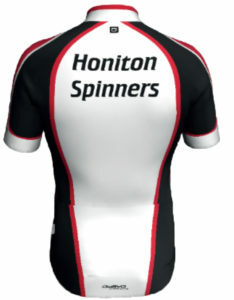 Look out for us in our distinctive kit, which members can purchase at a subsidised price. Please see the website for more details. A regular programme of rides aimed at a wide range of abilities, led by experienced cyclists. A weekly email up-date of coming rides and events. A group of riders to join up with for Sportive events. A membership card that entitles you to a 10% discount at Honiton Cycle, 1 Kings St. Honiton, on cycle accessories, but not on bikes or bike servicing. You must have lights and wear a helmet on club rides and have a bike that is roadworthy. You agree to follow the instructions of the ride leader and comply with the highway code. You are responsible for your own well-being during the ride and should be prepared for situations such as adverse weather conditions, mechanical problems and flat tyres. You will help another rider who encounters a problem on a ride or, if you cannot help, find someone who can. You will make your own arrangements to insure your bike, and to insure yourself against Third Party claims and/or personal accidents. Ensure that the ride leader has your up-to-date ICE number.